It's no secret I love me a good monogram. I'm super excited about this new store which is all about monograms! Have you checked out Mark & Graham yet? Its a new store by the Pottery Barn, William Sonoma folks and its great! 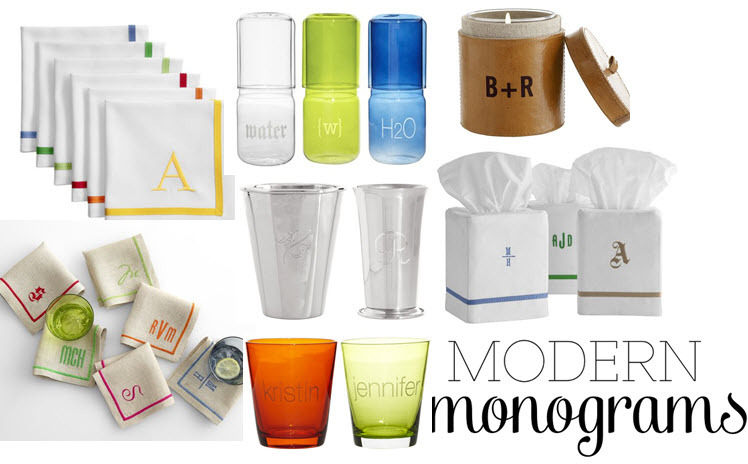 If you havent seen it yet go check out all the fun monogramed things they carry. Which is basically everything in case you are wondering. I'm guest posting today over at Party Resources- be sure to head over to Kate's blog and check out what things I would change about my wedding if I could. So hard to pick just a few, I love weddings and wish I could plan one every year! Don't I know it. Girlfriend, love us some monograms. Maybe its in the name? I checked it out the other day and just squealed. Can you ever have too many monograms? No way! I looked at Mark and Graham this weekend and I really loved several of their products. The monograms are so sophisticated. I seriously want everything on this website! I was just looking at their website yesterday - luh-ve! And thanks for the great guest post!